Asian Indians have the highest prevalence of undiagnosed diabetes upon international comparison (50% or more).8 Prevalence of undiagnosed diabetes increases with an increasing body mass index (BMI) or waist circumference. These high rates impose a huge economic burden on the country as well as upon individuals many of whom may be thrown into poverty as they spend 25-34% of their income on diabetes care (see Diabetes and Poverty). 1. Ramachandran A, Snehalatha C. Current scenario of diabetes in India. J Diabetes. Mar 2009;1(1):18-28. 2. Ramachandran A, Mary S, Yamuna A, Murugesan N, Snehalatha C. High prevalence of diabetes and cardiovascular risk factors associated with urbanization in India. Diabetes Care. May 2008;31(5):893-898. 3. Ramachandran A, Snehalatha C, Kapur A, et al. High prevalence of diabetes and impaired glucose tolerance in India: National Urban Diabetes Survey. Diabetologia. 2001;44(9):1094-1101. 4. Mohan V, Deepa M, Deepa R, et al. Secular trends in the prevalence of diabetes and impaired glucose tolerance in urban South India–the Chennai Urban Rural Epidemiology Study (CURES-17). Diabetologia. Jun 2006;49(6):1175-1178. 5. Ramachandran A, Mary S, Sathish CK, et al. Population based study of quality of diabetes care in southern India. J Assoc Physicians India. Jul 2008;56:513-516. 6. Subburam R, Sankarapandian M, Gopinath DR, Selvarajan SK, Kabilan L. Prevalence of hypertension and correlates among adults of 45-60 years in a rural area of Tamil Nadu. Indian journal of public health. Jan-Mar 2009;53(1):37-40. 7. Snehalatha C, Mary S, Joshi VV, Ramachandran A. Beneficial effects of strategies for primary prevention of diabetes on cardiovascular risk factors: results of the Indian Diabetes Prevention Programme. Diab Vasc Dis Res. Mar 2008;5(1):25-29. 8. Nyamdorj R, Pitkaniemi J, Tuomilehto J, et al. Ethnic comparison of the association of undiagnosed diabetes with obesity. International journal of obesity (2005). Feb 2010;34(2):332-339. 9. Mohan V, Radhika G, Sathya RM, Tamil SR, Ganesan A, Sudha V. Dietary carbohydrates, glycaemic load, food groups and newly detected type 2 diabetes among urban Asian Indian population in Chennai, India (Chennai Urban Rural Epidemiology Study 59). The British journal of nutrition. Jul 9 2009:1-9. 10. Mohan V, Shanthirani CS, Deepa R. Glucose intolerance (diabetes and IGT) in a selected South Indian population with special reference to family history, obesity and lifestyle factors–the Chennai Urban Population Study (CUPS 14). J Assoc Physicians India. Aug 2003;51:771-777. 11. Kaur P, Radhakrishnan E, Sankarasubbaiyan S, et al. A comparison of anthropometric indices for predicting hypertension and type 2 diabetes in a male industrial population of Chennai, South India. Ethn Dis. Winter 2008;18(1):31-36. 12. Bhalodkar NC, Blum S, Enas EA. Accuracy of the ratio of triglycerides to high-density lipoprotein cholesterol for predicting low-density lipoprotein cholesterol particle sizes, phenotype B, and particle concentrations among asian indians. Am J Cardiol. Apr 1 2006;97(7):1007-1009. 13. Mohan V, Deepa R, Velmurugan K, Gokulakrishnan K. Association of small dense LDL with coronary artery disease and diabetes in urban Asian Indians – the Chennai Urban Rural Epidemiology Study (CURES-8). J Assoc Physicians India. Feb 2005;53:95-100. 14. 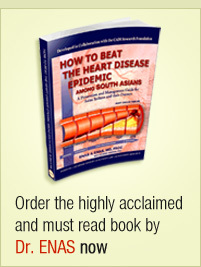 Ramachandran A, Ma RC, Snehalatha C. Diabetes in Asia. Lancet. Jan 30 2010;375(9712):408-418. 15. 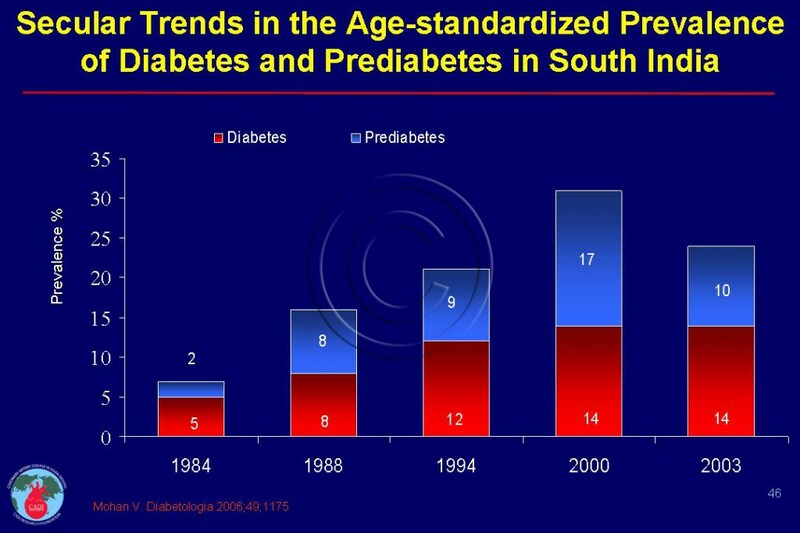 Mohan V, Deepa M, Anjana RM, Lanthorn H, Deepa R. Incidence of diabetes and pre-diabetes in a selected urban south Indian population (CUPS-19). J Assoc Physicians India. Mar 2008;56:152-157. 16. Huffman M D, Prabhakaran D, Osmond C, et al. Incidence of cardiovascular risk factors in an Indian urban cohort results from the new delhi birth cohort. J Am Coll Cardiol. Apr 26 2011;57(17):1765-1774. 17. Mohan V., Venkatraman JV, Pradeepa R. Epidemiology of cardiovascular disease in type 2 diabetes: the Indian scenario. J Diabetes Sci Technol. 2010;4(1):158-170.